The appellation “Neo-con” has been so unscrupulously bandied about the last few years, and so incorrectly used as a pejorative that the actual meaning of “neo-conservative” has become lost in the din of ignorant debate. 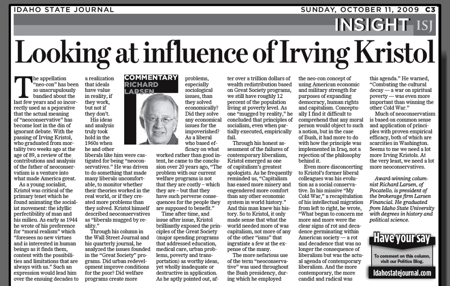 With the passing of Irving Kristol, who graduated from mortality two weeks ago at the age of 89, a review of the contributions and analysis of the father of neo-conservatism is a venture into what made America great. As a young socialist, Kristol was critical of the primary tenet which he found animating the socialist movement; the idyllic perfectibility of man and his milieu. As early as 1944 he wrote of his preference for “moral realism” which “foresees no new virtues and is interested in human beings as it finds them, content with the possibilities and limitations that are always with us.” Such an expression would lead him over the ensuing decades to a realization that ideals have value in reality, if they work, but not if they don’t. Time after time, and issue after issue, Kristol brilliantly exposed the principles of the Great Society (major spending programs that addressed education, medical care, urban problems, poverty, and transportation) as worthy ideas, yet wholly inadequate or destructive in application. As he aptly pointed out, after over a trillion dollars of wealth redistribution based on Great Society programs, we still have roughly 12% of the population living at poverty level. As one “mugged by reality,” he concluded that principles of socialism, even when partially executed, empirically fail. Through his honest assessment of the failures of contemporary liberalism, Kristol emerged as one of capitalism’s greatest apologists. As he frequently reminded us, “Capitalism has eased more misery and engendered more comfort than any other economic system in world history.” And this man knew his history. So to Kristol, it only made sense that what the world needed more of was capitalism, not more of any of the other “isms” that ingratiate a few at the expense of the many.